I don’t know about you, but when it comes to socks, I have a bit of an issue with all the heels I’ve tried so far: they never seem to fit me exactly right. Finally, I realized that what I need is something that fits the shape which my heel really is – ROUND! 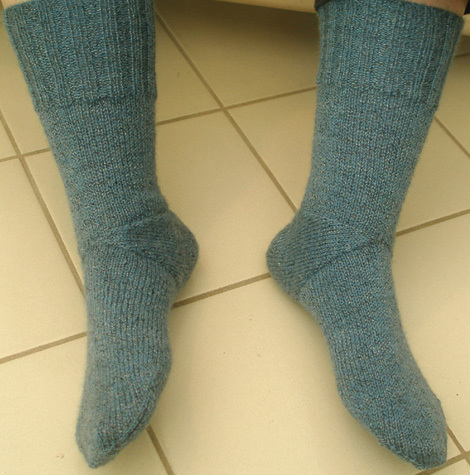 Such a revelation ultimately led to this pattern concept: The heel-out sock. You start by making what is essentially a tiny hat for your heel, from the top of the hat on out. Then you make two gussets, which are basically earflaps for the hat. 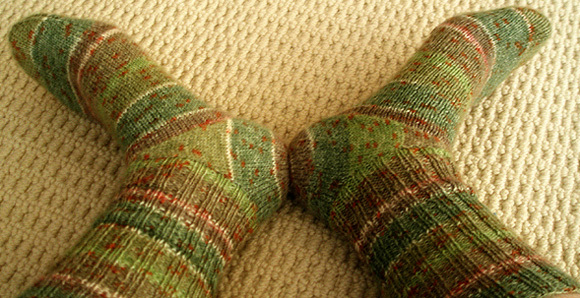 Each gusset tapers to a point at the top of the instep, and you join the points of the two gussets together. You then pick up stitches on one side of the gussets to make the foot, and then pick up the stitches on the other side of the gussets to make the leg (see fig.4). No uncertainty about how many stitches you’ll need to cast on: because you start right at the tip of the heel and make it bigger and bigger, you start every pair of socks the same way no matter what size feet you’re making the socks for. It looks pretty nifty, once you get your head past the idea that the gussets are in an unusual place. You get the “I know I’ll have enough yarn for both socks” advantage of toe-up construction. You get the “getting the correct foot length is easier” advantage of top-down construction. You get a heel that really, truly fits. 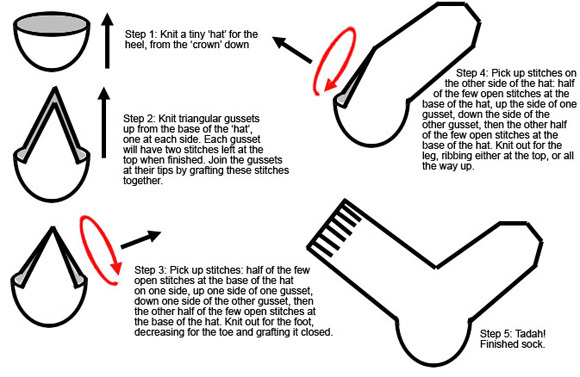 These pattern instructions are for a simple stockinette sock, and are intended to be just the beginning. Once you’re used to the construction, you can mix it up and add texture patterns, cables, lace, etc – whatever floats your boat. Have fun! This pattern is very specific about how stitches are held – some sts are slipped to scrap yarn, some sts are slipped to safety pins. Follow these instructions carefully, as they are to help you identify which stitches you’re working with at specific times. • Take two DPNs or the two ends of your long needle for magic loop and wrap the yarn figure-eight-wise around them so there are 4 loops on each needle. • With a separate DPN, K the 4 sts on the top needle. Then k the 4 sts on the bottom needle. You have now cast on for a closed tube. Round 2 (increase): [M1, k1] 8 times. 16 sts on needles. Baby size only: proceed to Secondary Increases. Round 3: Knit all sts. Round 4: [M1, k2] 8 times. Round 5: Knit all sts. Round 6: [M1, k3] 8 times. 16[24, 24, 24, 32, 32] sts on needles. Rounds 3-5: Knit all sts. Round 6: [M1, k2] 8 times. Rounds 7-9: Knit all sts. Round 10: [M1, k3] 8 times. Round 8: [M1, k3] 8 times. Round 9-11: Knit all sts. Round 12: [M1, k4] 8 times. Rounds 13-15: Knit all sts. Round 16: [M1, k5] 8 times. Rounds 17-19: Knit all sts. Round 20: [M1, k6] 8 times. Round 10: [M1, k4] 8 times. Rounds 11-13: Knit all sts. Round 14: [M1, k5] 8 times. 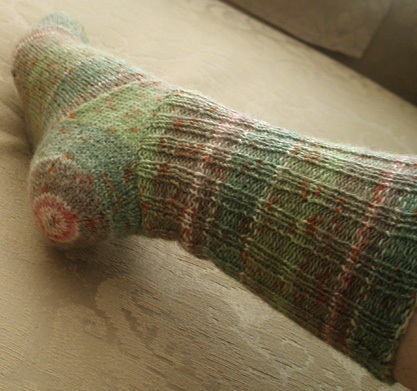 Rounds 15-17: Knit all sts. Round 18: [M1, k6] 8 times. Rounds 19-21: Knit all sts. Round 22: [M1, k7] 8 times. Rounds 23-25: Knit all sts. Round 26: [M1, k8] 8 times. 32[40, 48, 56, 64, 72] sts on needles; 10[12, 16, 20, 22, 26] total rounds worked. Work 3 more rounds even. K14[17, 21, 24, 27, 31], turn. P12[14, 18, 20, 22, 26]. Slip remaining 2[3, 3, 4, 5, 5] sts to a spare length of yarn, turn. RS is now facing. From here, you will now be working flat with the 12[16, 18, 20, 22, 26] sts that you just finished purling. Row 1 [RS]: K1, SKP, K to last 3 sts, K2tog, K1. Row 4 [WS]: P1, P2tog, p to last 3 sts, p2tog tbl, p1. Repeat the above 6 rows until 4[6, 6, 4, 6, 6] sts rem. Next row [RS]: SKP, K2tog. Next row [WS]: P2tog, p2tog tbl. Work 2 more rows even. Place remaining 2 sts on a safety pin. Break yarn, leaving about an 8-inch tail. K16[20, 24, 28, 32, 36], turn. P12[14, 18, 20, 22, 26]. Slip remaining 4[6, 6, 8, 10, 10] sts to a spare length of yarn, turn. RS is now facing, and you will now be working with the 12[14, 18, 20, 22, 26] sts that you just finished purling. Starting with the stitch to the immediate left of the gusset you just finished, with RS facing, rejoin yarn and (still with RS facing), K2[3, 3, 4, 5, 5], then place the 2[3, 3, 4, 5, 5] sts you just knitted onto a spare length of yarn. Slide the 2 sts on the safety pins at the tops of the gussets to two DPNs or the two ends of your long needle for magic loop (i.e. 2 sts from one safety pin onto one needle or end, 2 sts from the other safety pin onto the other needle or end). Using one of the 8-inch tails of yarn, graft these 4 sts together snugly. You will now be working in the round again, with the RS facing, and starting from where you left off before the graft. The first step is to get all the sts ready that you will need for working in the round; if you get stuck during this process, refer to step 3 in fig.4 for how it’s supposed to work. K2[3, 3, 4, 5, 5]. You are now at the base of the first gusset. Pick up and k13[15, 19, 21, 23, 27] sts up the side of the gusset right to the top. From here, you will begin working with the second gusset. Starting right at the top and working down, pick up and k13[15, 19, 21, 23, 27] sts all the way down the side of the second gusset. You are now at the base of the second gusset. 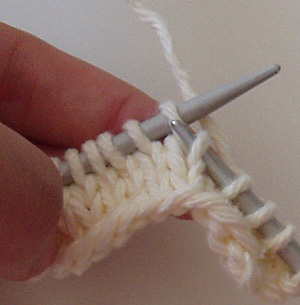 The next 2[3, 3, 4, 5, 5] sts are on a spare length of yarn – place those sts onto a needle and knit them. You have now completed picking up all the sts, and you should have a complete round. 30[36, 44, 50, 56, 64] sts total. Work st st (i.e. K every round) until foot (from the back of the heel to the most recent round worked) is 8[10, 11, 13, 14, 16] rounds short of the desired full length of the foot – at correct round gauge, this will be "0.75[0.875, 1, 1.1875, 1.25, 1.5] inches less than the desired length of the foot. Remove existing marker, k7[9, 11, 12, 14, 16] and replace marker to indicate new beginning of the round. Toe round 1: [SKP, k11[14, 18, 21, 24, 28], k2tog] twice. Toe round 3: [SKP, k9[12, 16, 19, 22, 26], k2tog] twice. Baby size only: proceed to Secondary Decreases. Toe round 5: [SKP, k-[10, 14, 17, 20, 24], k2tog] twice. Toddler and Small Child sizes only: proceed to Secondary Decreases. Toe round 7: [SKP, k-[-, -, 15, 18, 22], k2tog] twice. Older Child and Woman sizes only: proceed to Secondary Decreases. Toe round 9: [SKP, k-[-, -, -, -, 20], k2tog] twice. Toe round 5: [SKP, k7[-, -, -, -, -], k2tog] twice. Toe round 6: [SKP, k5[-, -, -, -, -], k2tog] twice. Toe round 7: [SKP, k3[-, -, -, -, -], k2tog] twice. Toe round 7: [SKP, k-[8, 12, -, -, -], k2tog] twice. Toe round 8: [SKP, k-[6, 10, -, -, -], k2tog] twice. Toe round 9: [SKP, k-[4, 8, -, -, -], k2tog] twice. Toe round 10: [SKP, k-[-, 6, -, -, -], k2tog] twice. Toe round 9: [SKP, k-[-, -, 13, 16, -], k2tog] twice. Toe round 10: [SKP, k-[-, -, 11, 14, -], k2tog] twice. Toe round 11: [SKP, k-[-, -, 9, 12, -], k2tog] twice. Toe round 12: [SKP, k-[-, -, 7, 10, -], k2tog] twice. Toe round 13: [SKP, k-[-, -, -, 8, -], k2tog] twice. Toe round 11: [SKP, k-[-, -, -, -, 18], k2tog] twice. Toe round 12: [SKP, k-[-, -, -, -, 16], k2tog] twice. Toe round 13: [SKP, k-[-, -, -, -, 14], k2tog twice. Toe round 14: [SKP, k-[-, -, -, -, 12], k2tog twice. Toe round 15: [SKP, k-[-, -, -, -, 10], k2tog twice. 10[12, 16, 18, 20, 24] sts rem. Close the toe by grafting the remaining sts. You will once again be working in the round. The first step is to get all the sts ready that you will need for working in the round; if you get stuck during this process, refer to step 4 in fig.4 for how it’s supposed to work. 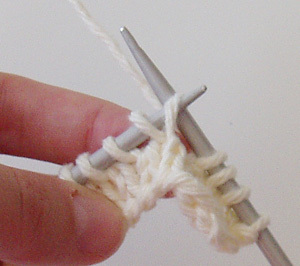 At the open end of the tube (the closed end of the tube is where the toe is), there are 4[6, 6, 8, 10, 10] sts on a spare length of yarn, in between the two gussets. 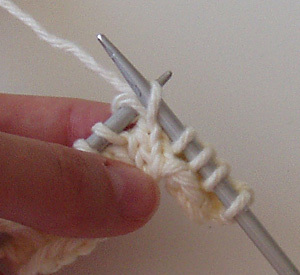 With RS facing, place the left-most 2[3, 3, 4, 5, 5] of these sts on a needle, leaving the right-most 2[3, 3, 4, 5, 5] sts still on the spare length of yarn. You will be continuing to work starting with the 2[3, 3, 4, 5, 5] sts you just put on a needle. Repeat instructions from *** to ***. You can now work the leg as you wish. You can either start by working st st (i.e. K every round) and end with at least 1[1, 2, 2, 2.5, 3] inches of ribbing, or work ribbing for the entire length of the leg – it’s your choice. For all the baby & children’s sizes, work [k1, p1] ribbing. For the two adult sizes, work[k2, p2] ribbing. Just make sure that by the time you finish the cast-off for the leg, you have not used up more than half your available yarn (assuming, of course, that you are making two socks). Cast off using a 4mm[4mm, 4.5mm, 5mm, 6mm, 6mm] needle. Kathleen learned to knit when she was about seven or eight years old, then became utterly obsessed with it about ten years ago. She will knit anything which strikes her fancy, no matter how simple or complex (although her tastes tend to favor the complex), and she is very bad at the delayed gratification thing. This, naturally, has led to an extremely large list of works-in-progress, which take up a lot of the living space she shares with her wonderful husband and two fantabulous daughters. She blogs to keep track of it all here.